Along with all the hooved creatures we see and record, Prince Albert National Park's west side boasts winged abundance unlike anything I've experienced. Here's a glimpse of some of what we see flitting through the trees, squawking in the meadows, and fluttering underfoot. The ruffed grouse (Bonasa umbellus) pictured above inhabits a particular patch of woods along one of the trails we walk nearly every day. Without fail, that bird (or one of its brood) gives us a heart attack as it drums and flushes loudly, seemingly out from underneath an elbow. In this particular situation, Jerod managed to sneak up on it without spooking it. Chives (Allium schoenoprasum) growing alongside the front porch may seem a little out of sync with the wildness surrounding us. However, they are the sole domesticated plant growing near our cabin. After so many years of gardening as a way of life, I don't know if I could have chosen just one plant, had I been forced to choose. Now that we've spent the summer with this pollinator-laden patch of chives, though, this hardy, tasty and attractive herb would be high on my list. The window frame on which this barn swallow (Hirundo rustica) and its nest are perched is actually the main window in the living room of our cabin. An agile and tireless pair of swallows spattered bits of mud against the window as they built that daubed-together shelter. They successfully hatched four chicks, and despite our discovery of one of the pair dead beneath the window later in the summer, the chicks successfully fledged. They still roost in the nest at night, though. They make a comic sight in the morning, far too big for the nest, and jammed together between it and the roof above. On the same day we indulged in a pollinator photography marathon in the chive patch, I also spent some time watching a handful of these White Admiral butterflies (Limenitis arthemis) out on the gravel path. Since one of the routes we travel every day is on an old dirt road, I find myself dodging butterflies most afternoons. One of my favorite observations, made over the course of the summer, has been that different butterflies emerge at different points in the season. Maybe that seems obvious, but I had never noticed it before. 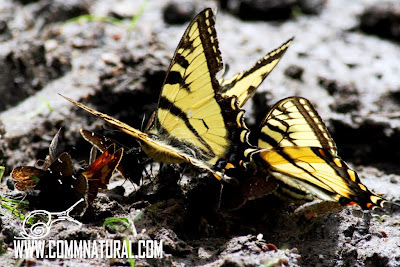 The earliest seemed to be vivid yellow swallowtails (Papilio canadensis), followed by some of the smaller dark ones and a range of orange, black, and white-speckled species. A while later, the White Admirals appeared, along with striking dusky Northern Pearly-eyes (Enodia anthedon), notable for their several yellow-ringed "wing-eyes." 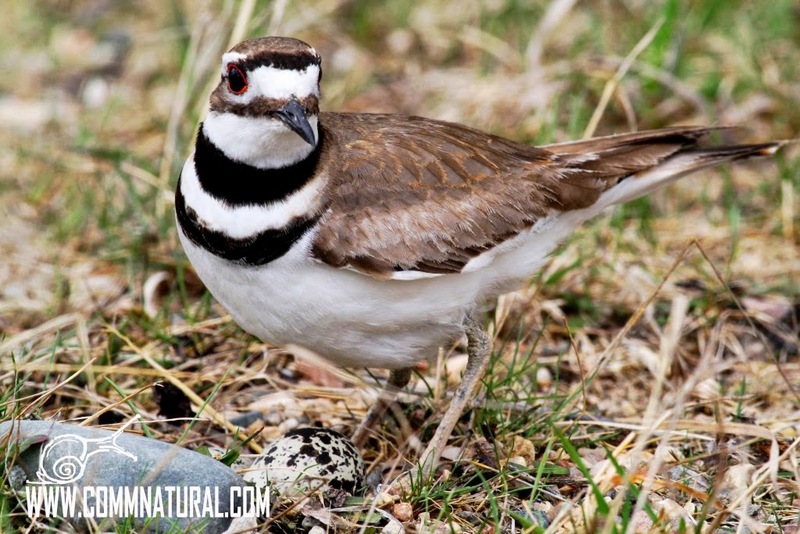 This killdeer (Charadrius vociferus) was vigorously defending its nest - a pair of stunning speckled eggs. She had laid them smack in the middle of the West Side Road, a boundary road which we occasionally travel looking for wolf scats. The killdeer stared us down long enough for us to capture a handful of images, and to notice the glowing gem-red of her eyes. 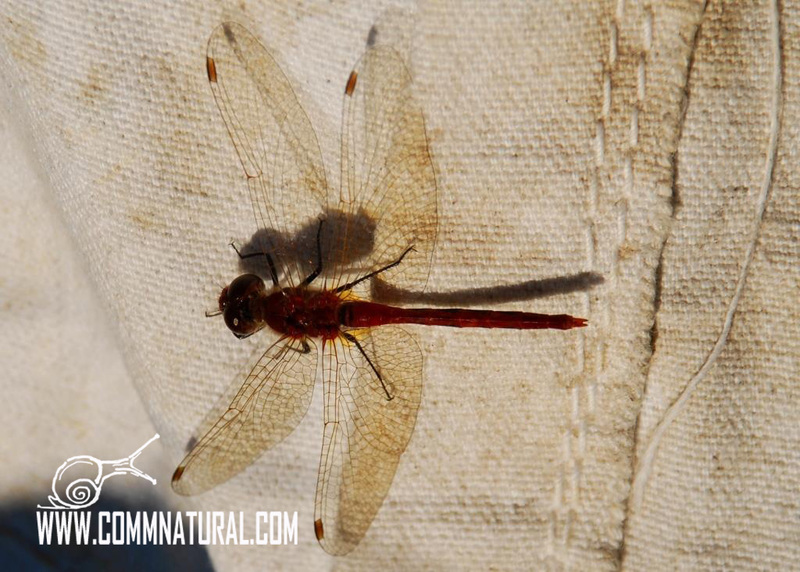 We spotted this dragonfly resting on a canvas tipi set up in one of the meadows we regularly check. A local outfitter sets up these tipis and brings in horse rides for day trips and overnights. This is what the tipis look like. As with the procession of butterflies, the dragonflies seem to change over the summer. These amber-colored ones were some of the latest to emerge, preceded by much larger ones in variegated colors. Nearly every meadow in this corner of the park boasts a vocal pair of fawn-colored sandhill cranes (Grus canadensis). 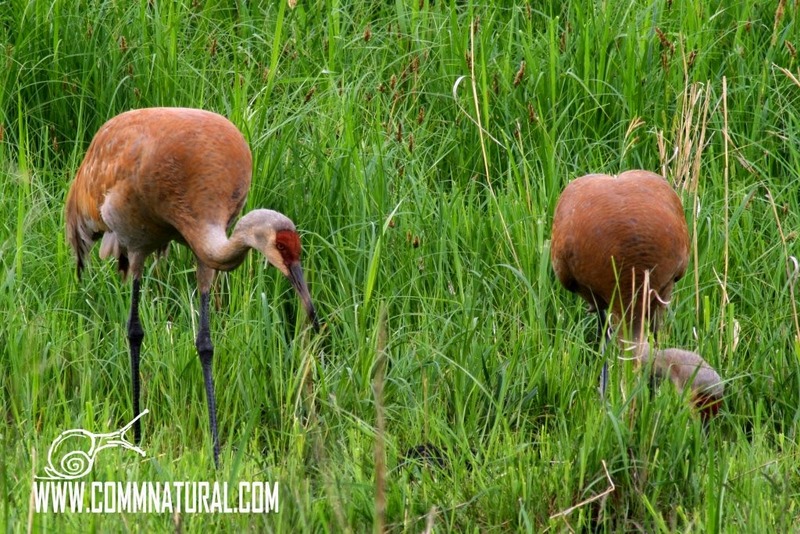 Larger than great blue herons, they are tall enough to be visible even over the astonishing height of the grasses. Ever-vigilant, they are often the first wildlife to notice our presence, and proclaim it at the top of their lungs with calls that hark back to prehistory. On the rare occasion, they don't notice us first, and we get a chance to capture images like this. One afternoon, as I was crossing a particularly soggy meadow, this insect stopped me in my tracks. Despite a breeze stiff enough to flatten the grasses, this one hung motionless on a grass blade. I came home excited about the crazy butterfly - orange and metallic blue - and later learned it was actually a moth. 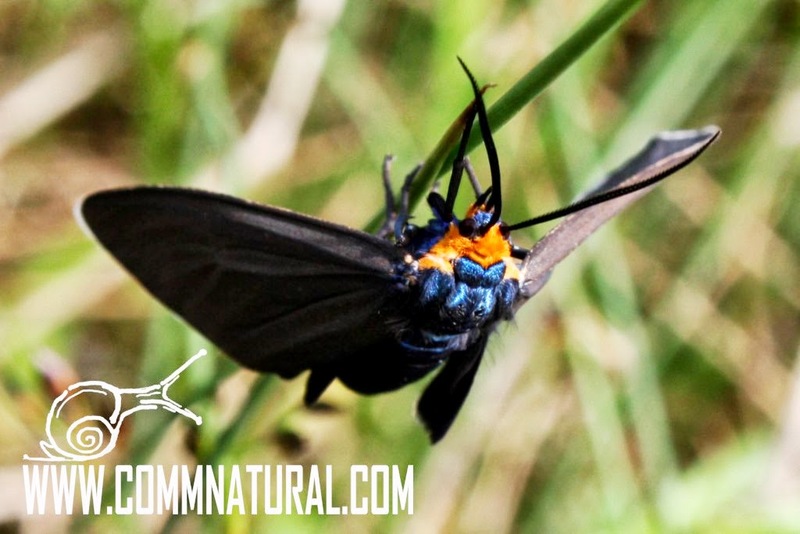 This one is a Virginia Ctenucha (Ctenucha virginica), one of the many knock-out wasp moths. The moths up here have given me a whole new appreciation for moths. We see superlative-inducing moths in broad daylight, in sizes and colors beyond imagining. These two were in this position - motionless, nearly as large as the palm of my hand, and bogglingly fuzzy - for at least 12 hours. 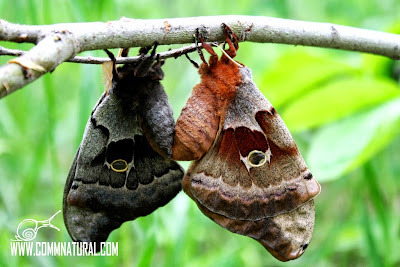 And just what are these Polyphemus moths (Antheraea polyphemus) doing? Exactly what you think. They live only one week as adults, and do not have functional mouth parts...so they might as well make the best of the time they have. The one on the left is the male - you can tell by his larger, branching antennae. These are quite sensitive, and enable him to key in on pheromones released by the female. Imagine trying to find a fellow moth in a 2-million acre national park - harder than online dating, I bet. This past week was also National/International Moth Week. Check out this website for info on moth viewing, identification, and interesting facts such as that moths make up nearly 90% of the Lepidoptera order (the same order as butterflies and skippers). For more PANP photo highlights, visit our Flickr gallery. Thanks, Wes! The greatest part is all the "time stands still" moments that accompany capturing images like these. Awe, this post was a sweet one. Nice! Cool. Linda and I jumped a pair of ruffed grouse on a hike up in Dupuyer Creek last week.